As of April 5, 2016, we have implemented a new email verification process to safeguard our customers/servers. This process will no doubt be very new to most of our customers but hopefully, not without familiarity as most web-based software applications are turning to a web verification process to vet out harmful email addresses to their system. 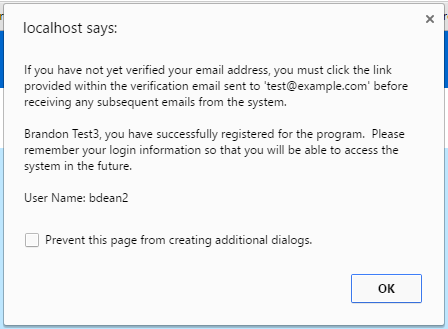 Important Note: This verification email process is only applicable to those libraries who are using Evanced's Amazon SES and have a least one of the email features enabled in your Classic Summer Reader site enabled (ex. 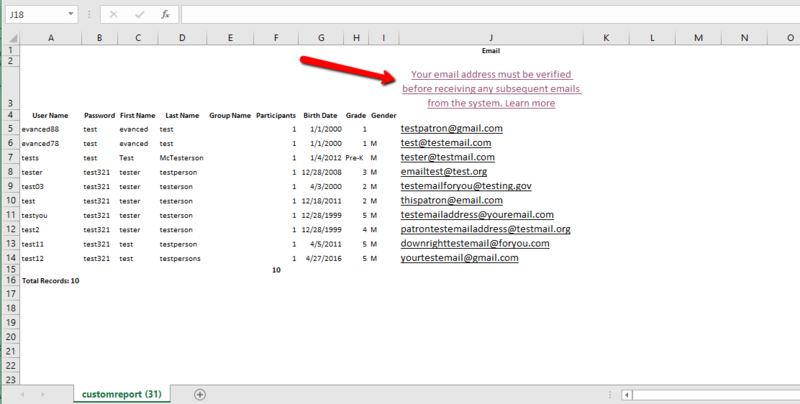 "Confirmation Email Enabled") in the email setup area. Here is how you can check to see if you are using our Amazon email service. System Maintenance > Email Setup > Look for the @evancedsummerreader.com email address extension. If you have the @evancedsummerreader.com email address extension as demonstrated below, then any patron email sent from the system, will be under the new email guidelines. In addition to having the @evancedsummer.com sending email name extension visible, you also need to have at least one of the email service options enabled as well. 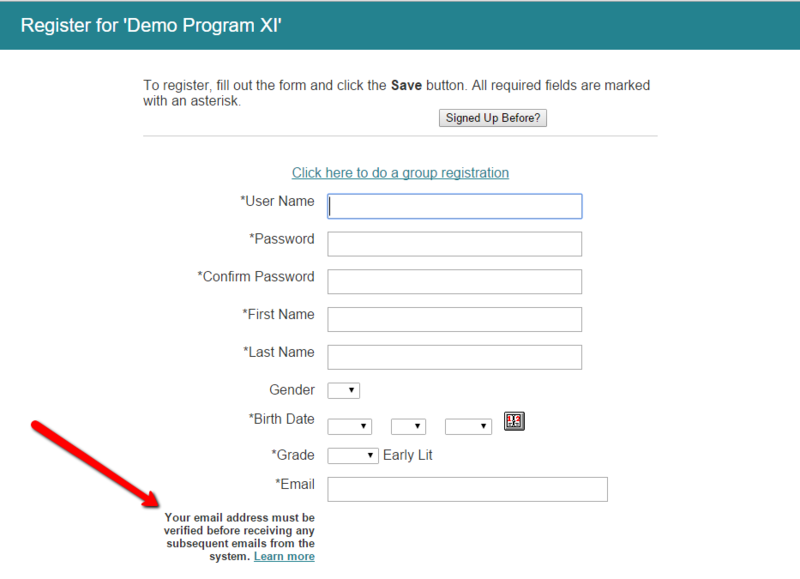 NOTE: If you do not include any text in the "Sending Email Name" field on the Email Setup page (ex. noreply) your email service will not function. Below are a list of best practices that we highly recommend implementing so as to ensure a successful problem-free Summer Reading 2016 season and beyond. The first, and undoubtedly most important Best Practice we recommend, is to provide your patrons with plenty of notification within your library as well as within the program home page of your various reading programs. Additionally, you may consider including the following example copy and link in the "Important Messages" area of your Classic Summer Reader software to notify your patrons of the verify email process. You can edit the Important Messages area for all of your library's programs by update the "Global Messages" area (System Maintenance > Program Messages > Global Messages). Be sure that you familiarize yourself and applicable staff with the verification process in order to train patrons and volunteers for when questions arise. Point your patrons/staff to an explanation of the patrons side of the verification process and workflow. Train staff on how they can check and see if a patron's email address is verified, and what instructions to pass along to a patron who is not receiving emails from the system. If using our Amazon email service, be sure that your site has been updated with patron-facing in-app messaging that references the new verification process to your patrons. If your site is missing the following language pictured below, please contact Evanced Support to help ensure this language gets included on your Summer Reader site. NOTE: When the verification email language is enabled, the same language will also be duplicated in the email field when running reports, and on the staff side, when searching for patron records. We recommend that you export your reports as an Excel or CSV file, and simply remove the verification email language from the report in Excel (or your preferred spreadsheet editor). Posted - Mon, Apr 4, 2016 at 1:38 PM. This article has been viewed 4228 times. How do I Add a New Header in Summer Reader? How do I change the layout of a review?